Food products by their nature are ideal media for growth of micro-organisms including many pathogens. For that reason all food manufactures are obliged to maintain a high hygienic standard. Cleaning-in-place (CIP) systems circulate cleaning liquids in a cleaning circuit through machines, processing lines and other equipment. The cleaning cycle compromises different stages with water and cleaning detergents and each stage requires a certain length of time, temperature, flow, velocity and concentration of detergent to achieve an acceptable result. Cleaning and sanitization of process plant is one of the most critical aspects of food processing to ensure the health and safety of the consumer. Proper cleaning is essential for the production of high-quality food products, especially those with extended shelf life. 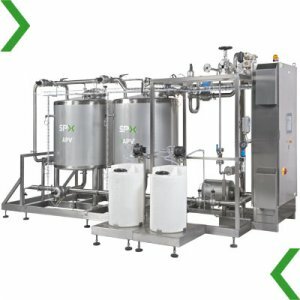 Apart from the installation of large bulk units and/or distributed CIP units during initial plant design, BEECO also manufactures a range of standard skid-mounted CIP modules for cleaning of individual process units. These systems are ideal for upgrading of CIP systems to reduce bottlenecks and enable the plant to go back on commercial production.